Loose teeth are quite common among babies. But when it comes to adults, it’s something we all dread. You are likely to get worried when you have a loose tooth as an adult simply because you cannot grow a replacement one. In fact, loose teeth could be a sign that something is wrong and needs to be addressed by your dentist Richmond Hill. Let’s look at a few basics on loose teeth to help you understand the causes and your options for treatment. Why do teeth become loose? Excessive bite force: Aggressive biting that the tooth can no longer tolerate can damage its ligament and cause it to become loose. This excessive biting force is usually experienced as a result of habitual grinding or clenching of teeth. Some people who are suffering from misalignment issues may also experience excessive bite force since the tooth is not positioned well and hence sustains much more force than what it can withstand. This is often corrected using a variety of general dentistry procedures. Periodontal diseases: When a periodontal disease advances and goes untreated, it may result in ligament damage. This happens because bacteria invade the teeth and gums causing extensive bone loss. The ligaments are unable to withstand any force that is applied on the teeth because of significant loss of bone tissue. The other reason for loose teeth is a traumatic blow to the face. This is an injury that targets the jaw bone causing extensive damage to the ligaments. It is important to visit the dentist and discuss options to ensure the tooth heals in its proper position. If you have loose teeth, the approach to treatment will depend on the cause and intensity of the tooth looseness. There are a few treatment options that may be recommended at your local dental office Richmond Hill. Let’s review a few below. Wearing a mouth guard: If the loose tooth is as a result of bruxism, your dentist may recommend a mouth guard in order to protect the upper and lower teeth and correct the condition. Occlusal adjustment: This is done to reduce the amount of bite force that the tooth receives by reshaping its surface. The tooth may also be aligned better using some form of orthodontic treatment. The dentist will review your overall condition and figure out the way forward. 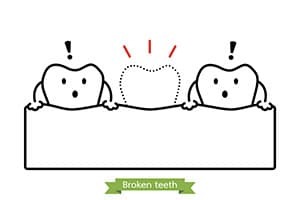 Splinting: This is done to help reduce the bite force that is causing teeth to become loose. It involves joining the teeth together but it only works depending on the level of bone loss the individual has experienced. Never ignore an issue like tooth looseness because it simply will not go away. It can get worse and lead to permanent tooth loss.